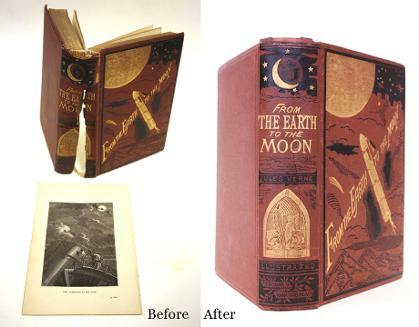 Original "From The Earth To The Moon" by Jules Vern book copyright printed 1874 with concertina binding, gold leaf edges, marbled paper, embossed gold designs, letter typesetting, & engraving illustrations. Before & after restoration. German etching on paper by Fritz Ulrich c. 1925, titled "Humanity Without Justice (Menschheit Ohne Gerechtigkeit)". Acidic mat burns, discolored paper. Aqueous cleaning & deacidification of paper. Kathe Kollwitz self portrait etching engraved print on paper from Germany c. 1930s. Acidic mat burns, surface dirt, tape adhesive & adhesive residue, folded & creased paper, framing instruction pen marks. Tape removal, aqueous cleaning & deacidification, unfolded creased paper, flattened paper. 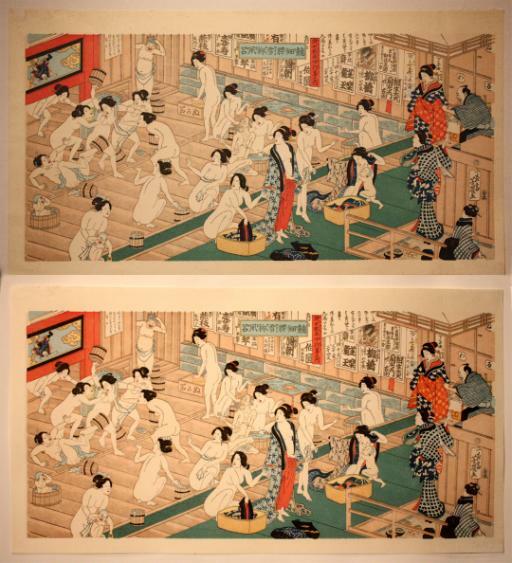 Japanese woodblock print on paper of women's bath house c. 1900, unsigned. Foxing spots, acidic mat burns, discolored paper, mounted to acidic board, tape mounting residue. Demounted from acidic board, tape residue removal, aqueous cleaning & deacidification. 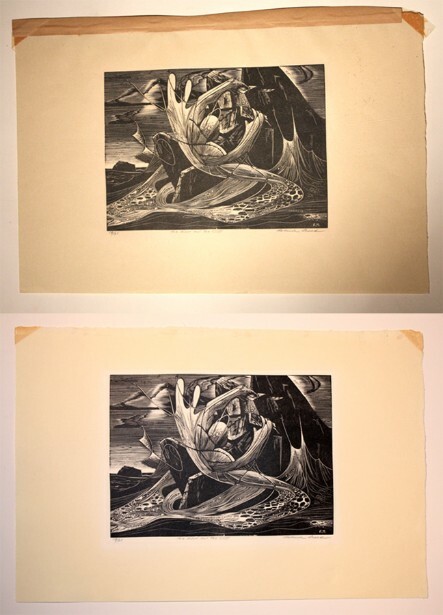 Woodblock print "The Wave & The Cliff" signed by Roderick Mead c.1938. Mounting tape residue, acidic paper, foxing spots in paper.